After Abbot Kinney built his summer home in Santa Monica in 1886, he became interested in land development along the Pacific Coast. 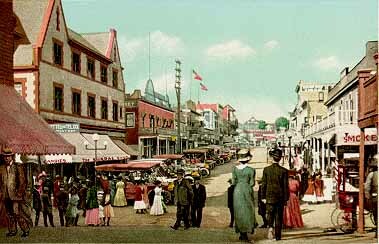 Although the real estate market crash of 1888 derailed his plans to develop the area which is now Pacific Palisades, he shifted his attention to the coastal area south of Santa Monica in 1891. 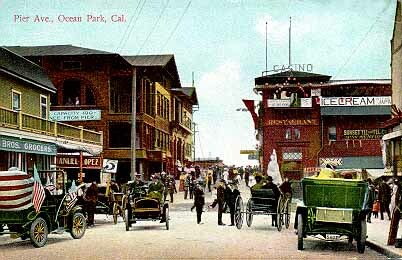 Kinney and his partner Francis Ryan acquired a controlling interest in the Ocean Park Casino (actually a restaurant and tennis club) on June 23, 1891. Several months later they decided to purchase the surrounding tract of land for $175,000 from Captain Hutchinson, a British Army officer. The man had acquired the beach front property in the late 1870's when he foreclosed on a series of loans made to the Machado family on parts of their La Ballona Rancho. The plot of land which extended 1-1/2 miles south of what is now Pico Boulevard in Santa Monica to Mildred Avenue in Venice, for the most part extended inland only 1000 feet, but curved eastward to a depth of half a mile along the southern end. The northern third located in Santa Monica had development potential, while the remainder in county territory was wetlands consisting of sand dunes and marsh. They quickly realized that the success of their beach resort would require reliable, inexpensive and direct rail service from Los Angeles. But Santa Monica businessmen, who feared competition to their North Beach resort, persuaded Colis Huntington of the Southern Pacific Railroad to be uncooperative. Instead Kinney enticed the rival Santa Fe Railroad to extend their Inglewood line north to his resort and donated twelve acres to its right of way. The first train arrived at its Hill Street depot on June 18, 1892. But it wasn't until the following spring that the first advertisements appeared for Kinney and Ryan's "Santa Monica Tract." The 25 x 100 foot lots were priced at $100 and featured piped water. As an incentive to purchasers, three small four room cottages were built and lottery was held. They were given to the lucky buyers who drew the lot on which they stood. Lots naturally sold well, even in those bad economic times. Tents were erected on unsold lots and were available to campers for summer rental. The YMCA of Southern California, after a long search, accepted Kinney and Ryan's offer of a five acre strip of land. 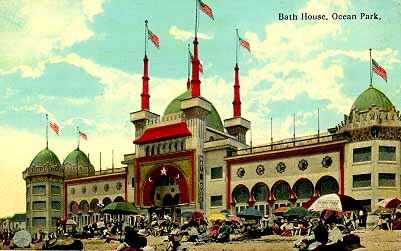 They erected a large bathhouse there that summer and a two story pavilion for religious meetings the following year. The community was renamed Ocean Park in May 1895. The community grew slowly until there were nearly 150 cottages by Spring 1898. That year proved to be a boom year as several new business buildings and forty beach cottages were constructed. Kinney's new 40 acre Ocean Park race track and golf links located near their Casino Country Club at southern end of the property opened. 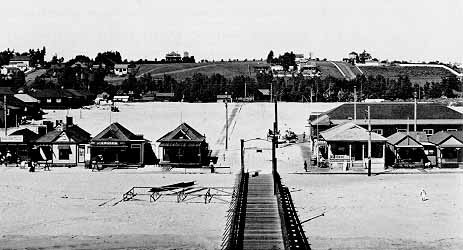 The city of Santa Monica on June 30, 1898 granted Kinney and Ryan permission to build a 1250 foot long pier at Pier Avenue on pilings already being used to carry the city's 200 foot long outfall sewer. The pier served two purposes; to protect and extend the sewage pipes seaward so the currents wouldn't pollute their property south of it, and as a pleasure wharf for tourists and fishermen. The pier was completed in less than six weeks. Francis Ryan didn't live much longer to enjoy their success. He died unexpectedly of a heart attack in October. His widow quickly remarried and Kinney suddenly had a new partner. Thomas Dudley was a Santa Monica businessman and politician who was elected as a Trustee the following year. Despite political connections, municipal assistance for their resort produced few results and city services were lacking. 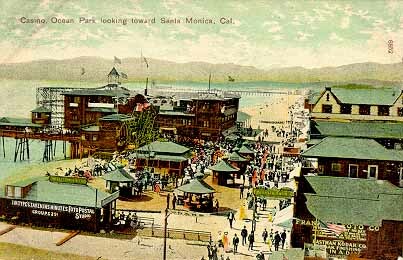 When Dudley finally sold his half interest in the resort in February 1902 for $400,000, it was a clear indication that Santa Monica's business establishment feared that Kinney's resort would draw tourist dollars from their North Beach resort, and that it would not support Kinney's plan to compete against Sherman and Clark's Los Angeles Pacific trolley service. Kinney's three new partners, Alexander Fraser, Henry Gage and George Meritt Jones immediately invested in improvements. Their plans included installing a sewer system for the community, extending the beach walkway to the extreme end of their tract, developing the residential tract immediately south of Rose Avenue, and constructing a large bathhouse. Unfortunately Kinney didn't get along with them, probably because they refused to support any of his projects. First they weren't willing to make enemies of powerful rival businessmen by supporting Kinney's rival trolley company. Secondly they were more interested in their money losing Casino (restaurant and vaudeville theater) that the built beside the pier. Thirdly, they disagreed on how the wetlands on the southern portion of their land should be developed. Kinney's strategy was two-fold. First he made plans to create an independent municipality south of Marine Street in unincorporated County territory, and second to get rid of his partners. By September 1903, his supporters began circulating a petition proposing a new 6th class city to be called Ocean Park. An election was scheduled for February 13, 1904. The partners finally agreed to dissolve their partnership and divide their holdings based on the flip of a coin. They met at the company's offices for one last time in late January 1904. One of the partners tossed a coin high in the air. Kinney called "Tails" and the coin landed on the floor tails up. The three partners contemplated what they would do with their mostly worthless water logged land. Kinney examined the coin carefully in his hand. It was a decision that he had previously thought about long and hard. "Ill take the salt marshes", he replied. His partners gasped in amazement and smiled in relief. Kinney, always the dreamer, would build his Venice of America on that seemingly worthless land. 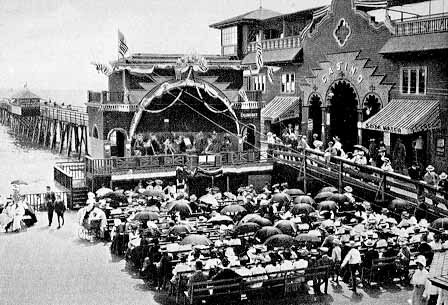 Kinney's former partners improved their resort by spending $185,000 in 1905 to built their Ocean Park Plunge, an ornate indoor hot salt water swimming pool. It opened the same weekend that Kinney's Venice of America opened, July 4, 1905.